How Do You Graph a Piecewise Function? If you want to graph a piecewise linear function, graph each function on it's specific interval separately. Bring it all together, and you have your graph! 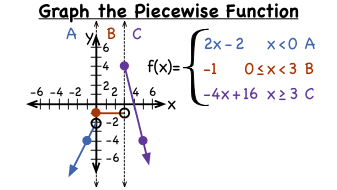 This tutorial shows you the entire process for graphing a piecewise linear function. Trying to figure out if an equation is a function? Graph it and perform the vertical line test. If it passes, then it's a function! Get some practice by watching this tutorial! What's the Vertical Line Test? Even graphs need to worry about tests! Using the vertical line test, you can figure out if a graph is a function or not. Watch this tutorial and learn about the vertical line test. Then, put your graphs to the test! What is a Continuous Function? You've probably seen a continuous function before and not even known it! In this tutorial, you'll learn what a continuous function is and what a graph needs to have in order to be continuous.